hi to you jimmy eat world! 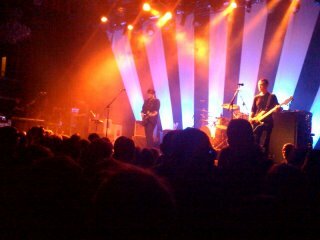 last night, jimmy eat world played the fillmore, a teeny venue 1 block from where i live. they played the entirety of clarity, as they published the album 10 years ago. my friend lydia got me a free ticket. i had a ton of work, and almost didn't make the show, but mike got one for a steal on the street, and we went together. yesterday was a horrific day for me, and i was quite upset and stressed. but i heard them play all of clarity, live, and i was about 100 feet from them when they did it. 0 Comments on "hi to you jimmy eat world!"